The only in-depth guide to the fascinating city of Lucca. 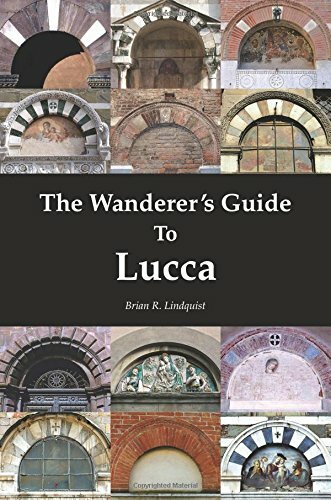 The book is keyed to The Wanderer's Map of Lucca for easy reference. Lucca is a maze of streets, all filled with secrets. The Wanderer's Guide to Lucca opens this hidden world to you by placing what you see in its historical context. The History: The two thousand years that made Lucca what it is today. The Churches: A comprehensive guide to 78 churches, present and past, with 30 floor plans and 16 numbered walking tours. The Palazzi: An architectural and historical introduction to 85 Medieval and Renaissance mansions and palaces. The Families: The stories of 40 of Lucca's greatest families. The Streets: Their origins and curiosities. The Walls: the Roman, Medieval, and Renaissance fortifications. More than 100 illustrations. Full color edition of The Wanderer's Map of Lucca. Brian Lindquist is a cartographer and writer. After a decade of research he published The Wanderer's Map of Lucca in 2006. The Wanderer's Guide to Lucca followed six years later. When not in Italy he lives in Connecticut.